How far past your fridge will you travel for fabulous food? Our brunch at the Sandbar Eatery in Mangawhai left me pondering this. Chef and owner Andrew Rennie set up the Sandbar with his brother Mark seven years ago. These days though he’s flying solo, albeit with the help of his exceptional team, and has just completed a very stylish re-fit via Kim Munro Designs and Jessica from Oh Gosh Graphic Design. The new look is far from the crush and clang of a Ponsonby café. The interior is light and contemporary with generously-spaced tables; outside there’s a large shaded outdoor seating area set around a courtyard that’s perfect for those travelling with children. Suzanne (Andrew’s wife) is the maitre’d and we’re all smiling even before we see the brunch menu, which reads extremely well and drives our expectations further northwards. It occurs to me that Andrew looks more front-row forward than foodie and as it happens, he played rugby in the UK and Europe for seven years. His parents, who had moved to Mangawhai, suggested that he and his brother set up a restaurant there. Andrew had always been a passionate amateur chef and his parents clearly recognised his potential; he is now a professional who cooks with exceptional flair and consideration. We started with the Smashed Avocado, served with a perfectly poached egg on five-grain toast with pingy capers, cherry tomatoes and a sensational whipped feta. This might be enough but the ‘extra points for winners’ was the sneaky chutney slipped in between the egg and the toast, bringing the flavours into brilliant balance. 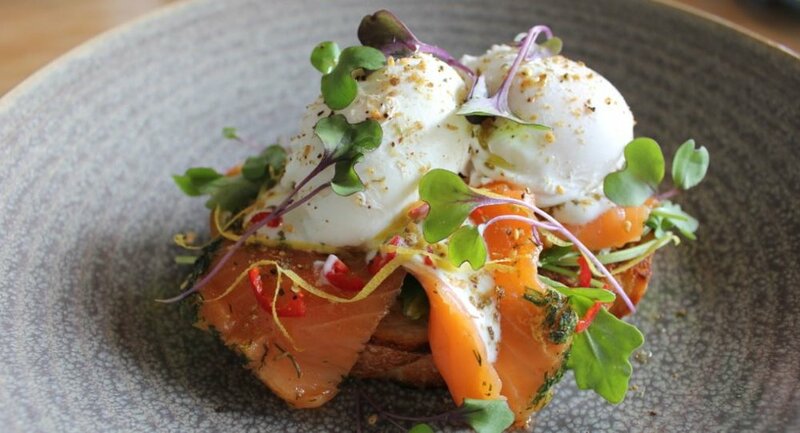 Next up was the Turkish Poached Eggs with cold smoked salmon, chilli, smoked yoghurt and dukkah on toasted sourdough. The richness of the eggs and herbed salmon was answered eloquently with lemon zest and chilli, and the smoked yoghurt gave this familiar dish a delicious point of difference. You have to come up with an excuse to order the Brioche French Toast with Nutella mousse, toasted hazelnuts and caramel. Pretend that that child over there is yours or say someone was joining you but got held up. Then, having discreetly licked the beautiful plate, (Andrew has selected a unique plate for every dish) order another excellent Atomic coffee and contemplate the short distance to the beach or the bach for a swim or snooze. I drove back to Leigh wondering just how far I’d travel to eat food this good. The answer is; a very long way. The Sandbar Eatery warrants more than a day trip – book a bach and experience breakfast, lunch and dinner. It’s worth every kilometre!